What is US Public Lands? Up until now, there has been no quick & easy way to retrieve the boundaries of these lands without carrying physical maps, books or digging deep online. Thank you to the National Atlas of the United States for providing public domain raw map data that we’ve been able to apply our proprietary rendering technology to create an interactive overlayable mapping & navigation tool. Know which US agency owns and operates the land you’re on or are heading to. Use the Setting’s ‘gear’ to select which agencies you want displayed. Links provided to each agency’s website included in the app, so that you can further your research as to what land use rules apply for each public land type – such as permits, fees, activities allowed and limits of stay. 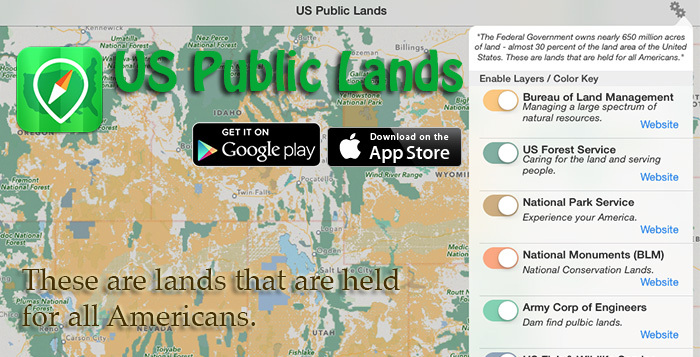 Be sure to turn on the ‘Basic’ base map to see the US Public Land labels for each land area. This base map layer is also stored entirely on your device, and can be utilize if you do not have an internet connection or would like to conserve bandwidth. If you have an internet connection, you can utilize Apple’s standard and satellite view maps as well. A boondocker’s assistant – by turning on the Satellite view map, you can better scout out trails, roads and boondock camping locations within the boundaries of the public land resources. Quickly toggle between ‘Show’ and ‘Hide’ of the US Public Land’s map overlays to assist. For an example of how this app can be used as part of researching potential boondocking locations read: Finding Magical Boondocking. If you have GPS access on your device, click the ‘Locate Me’ arrow to show your present location – to better orient yourself. Built in search, to locate anything that Apple maps supports (requires internet access) – including cities, states, zip codes, addresses and points of interest. A pin is dropped at the search location. Universal App – iPhone, iPod Touch and IPad, OS 7.1 and higher. Please note, the National Atlas maps only report to the nearest 640 acres (or about a square mile). This is obviously not detailed enough to be precise around borders, or for determining where private inholdings within public lands are located. 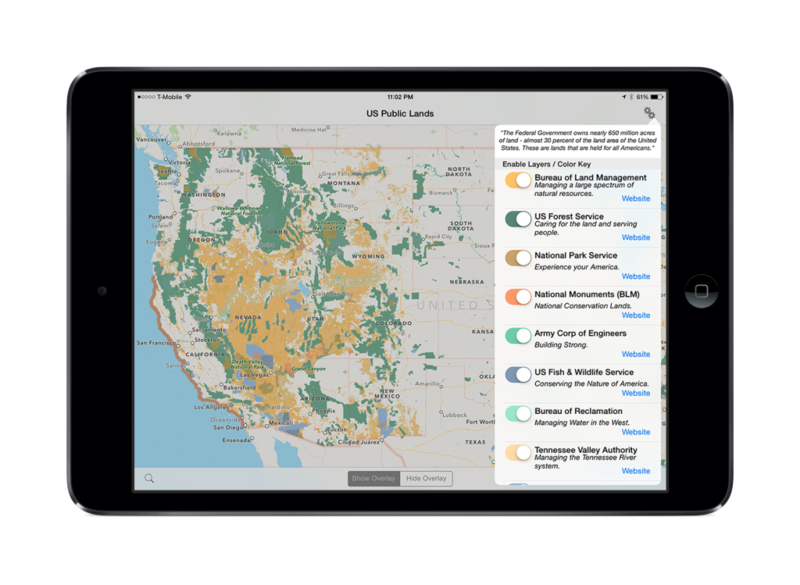 US Public Lands should only be used as an overview, and you should always confirm more precise details by consulting more detailed maps, local field offices or the websites links with in the app. Read more about US Public Lands, including the story behind it and why we were inspired to create it! Available now for iOS & Android devices – coming soon for Mac desktops!